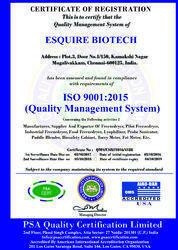 An ISO 9001- 2015 certified company,Established in the year 1994 Esquire Biotech is one of the renowned manufacturers, exporters and importers of Scientific Instruments, Scientific Research Instruments, Scientific Research Equipment and Scientific Equipment. With the effective usage of extensive R&D facilities we have incorporated latest design, technology and other vital features in our range of products & services to offer advance and cost effective scientific instruments. Further, to deliver safe and highest quality range, we have also developed quality management department, where every product is tested properly to ensure prerequisite functioning. With our commitment to all round excellence in the business, we have earned reputed clients like Tamilnadu Veterinary Animal Sciences Chennai, SRM University Chennai, University of Madras Chennai, King Institute of Preventive Medicine and TB Research Center, not only from India but also from Europe, Middle East, Far East & Asia. We are guided by our CEO "A. Sivasankar", who is a post graduate in chemistry and have expertise in research instruments. With his 24 years of experience in the respective domain, we have been able to carve a niche in both the domestic and international arena. Following the principles of international quality management, while establishing instruments and equipment to achieve complete customer satisfaction, we keep in mind our customers’ demand and expectations. In order to achieve our set goal of complete customer satisfaction, we adhere to all norms and regulations specified for our industry sector by competent international authorities. All the machines and instruments are passed through stringent quality check procedure to ensure prerequisite functioning. Our engineers and managers assure that the quality standards are as per the pre-established parameters. Our Biosafety cabinets are manufactured according to the NSF49 standards and available with ISO and CE certifications.